I have another video tutorial for you today. The last one I did was on the basics of Excel. You know by now how much I love Excel. And now, today, I’m introducing you to another great tool, YNAB. (Note: select the settings icon and adjust the picture quality if needed). If you prefer written tutorials, I have that below as well (I’ve got you covered!). If you were to ask me what tool I use the most for my personal finances, I would tell you without hesitation: YNAB. YNAB is short for “You Need a Budget”. Yes, it’s a budgeting software. No, it’s not your run-of-the-mill Quicken alternative. It’s much, much more. YNAB allows you to budget, track your expenses and monitor your financial accounts similar to other budgeting software programs. It sounds just as boring, but it’s not. If you don’t believe me about it being exciting, just go to their 2017 mixtape collection where they’ve put together some incredible popular song copies using personal finance lyrics instead. I recommend listening to “Just a Budget Meeting” inspired by Pink’s Just Give Me a Reason. After you see how cool they are, you’ll definitely want to sign up. Or, you can just sign up because it’s the best budgeting software out there. Period. Here’s why. A budget is not meant to be a money diet. It doesn’t need to be the lowest amounts that you could possibly spend to save more money each month. It’s simply a spending plan. You can plan to spend $500 on shoes this month. That’s fine as long as you can afford it. Doing the same with every dollar that comes in throughout the next months through the zero-based budget concept. To sign up for YNAB’s 34-day free trial, simply go to youneedabudget.com and click on “Try YNAB Free for 34 days”. Enter your email and a password and then go to your email to confirm your email. You’re all ready to log in to YNAB. Go back to the YNAB website and click “Log In.” You did it! A banner will show up on the top of the screen with a little checklist of sorts to help you get started. For now, just ignore this because we want to get our categories and sub-categories set up first. It’s so simple to edit all categories in YNAB and completely customize everything to the descriptions and order you want. I’m certainly biased, but I am going to show you how to set it up to match the budget spreadsheet from on the Making Your Money Matter mini-class on budgeting. Of course, you can set it up however you’d like. The right way to set it up is the way it makes the most sense to you. Note that the current categories and sub-categories can be moved around just by dragging and dropping them. To edit the descriptions, just click on the category name and enter a new name. A new main category can be set up by clicking the +Category Group button at the top. A new sub-category can be created by clicking on the + sign that will appear to the right of the category description when you hover over it. To match the budget spreadsheet, we will start with savings goals: emergency fund, retirement fund and other. Then we’ll go on to giving, housing, transportation, etc. including all the subcategories. I wish there was a way that I could share the budget template version directly with you to use in your own YNAB account, but unfortunately, I’ve researched it and can’t find a way to do so. First, they want you to set a goal. Okay, did I mention that I love YNAB? I think so…and this is the reason. Even in their checklist, they put goals FIRST. Let’s assume your initial goal is to have $1,000 in an emergency fund. We create that goal by clicking on the sub-category for emergency fund savings. One the right-hand side, you’ll click Create a Goal. There are several options and we’ll select “Target Category Balance by Date”. We want this by April 30th. If you have set goals you want to enter, do this now. Next, you’ll be prompted to add an account. You can do this by clicking on “Add Account” in the left sidebar. The default is to add an account that you automatically link online, but you can click “Add Manual Account+” if you prefer not to link it or have a different type of account that you’re adding. You’ll set a name for the account, select the type and enter today’s balance. If the date you want to start the account in YNAB is different than today’s date, you’ll be able to change that date through the account transactions later. Go ahead and add all of your accounts now. You may want to stick with accounts that will be included in your budget for now, which would exclude investment accounts, mortgages and other assets and liabilities. These will be helpful in tracking your net worth, but are not needed for your budget. You can see here how I’ve added several different accounts. When I entered the credit card account, it automatically set up a category and sub-category in the budget for the credit card (as seen in the budgeting section next), as there is a special way that credit card transactions are treated in YNAB (discussed in the next portion of the series). The next task is a big one: giving every dollar a job. You now simply assign your available money to different categories. All of the money in the accounts on the left will be totaled and included in the “To Be Budgeted” box at the top of the screen as well as the “Funds for Jan” to the right of that box. As you assign the money to categories, the “To Be Budgeted” amount will gradually go down to zero, which is your target. You’ll also see that the “Budgeted in Jan” will match the amount of money you’ve assigned to categories. For now, you can ignore the “Overspent in Dec” and “Budgeted in Future” sections. Its super simple to enter the budget amounts. If you’re over budget, you’ll need to adjust. If you are under budget, you have some extra funds to allocate to reach financial goals, put toward preparedness funds like auto and home repairs or save. Subscribe below to get exclusive access to my exact categories and accounts in YNAB. When you first look at YNAB, it may seem confusing. You may not like all the rules (sheesh, who needs more rules in their life?). They have a gazillion videos to watch and send you a gazillion emails when you sign up for their free trial. All you’re doing is taking every dollar that you own now and every dollar that comes into your life and making a plan for where it should go. If it doesn’t work out, it’s so easy to change your plan. This software is built for flexibility. If you haven’t yet tried YNAB, you should definitely give it a try and see for yourself how it can improve your finances. I’m a true believer that changing your financial situation will change your entire life. You can get a free 30-day trial of YNAB here. I like YNAB for a lot of people. It doesn’t work necessarily work for someone who is early retired like myself though. We live off investments and hold a few years expenses in cash. * YNAB wants us to budget all that money – which doesn’t work for us of course. I wish it had a way to just set a specific dollar amount that we want to target spend instead of looking at bank account balances. *So we aren’t pressured to sell investments during market downturns that happen every 3-5 years. We hold a good chunk of money in our emergency fund and budget that entire amount in a separate emergency fund category. This separates it from the rest of the budget. I think YNAB would be just as useful for early retirees for this reason-you can separate that amount that’s earmarked for a cash cushion in a separate category to make sure it isn’t included in the regular budget. Interesting. I might need to look at it again to check that out. Thanks. Just signed up for YNAB and I’m having trouble figuring out how to handle my credit card that we pay everything we can with it for airline miles. How do I keep track of use and payments on YNAB? I feel like I should be able to figure it out but I haven’t had any luck. And if that doesn’t help, definitely email me and I’ll help you figure it out! in another video you mentioned using tags in YNAB. Is there a video that shows how to access tags? I don’t personally have a video that shows the use of tags, as I’ve found that they haven’t been especially useful. The YNAB reddit group may be the best place to get more information about how others use them in their budget. I’m just getting started. 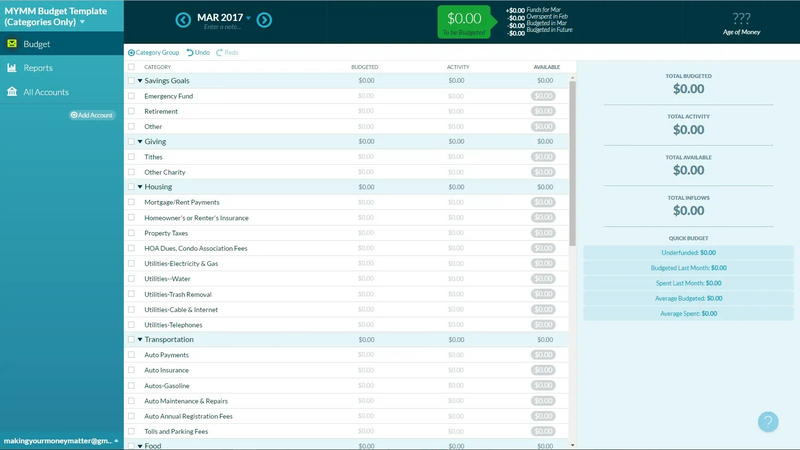 Would YNAB replace Quicken? If not, how is it different? It would replace Quicken, as it’s a budgeting and expense tracking software. But, it requires a different mindset from Quicken. Basically, you’re thinking about where you want all the money you currently have now to go, instead of the traditional income/expense. I can’t seem to find the line item setup you put on the video. Do you have an excel template of your line items we can look at to see if there are some things I forgot to budget for?